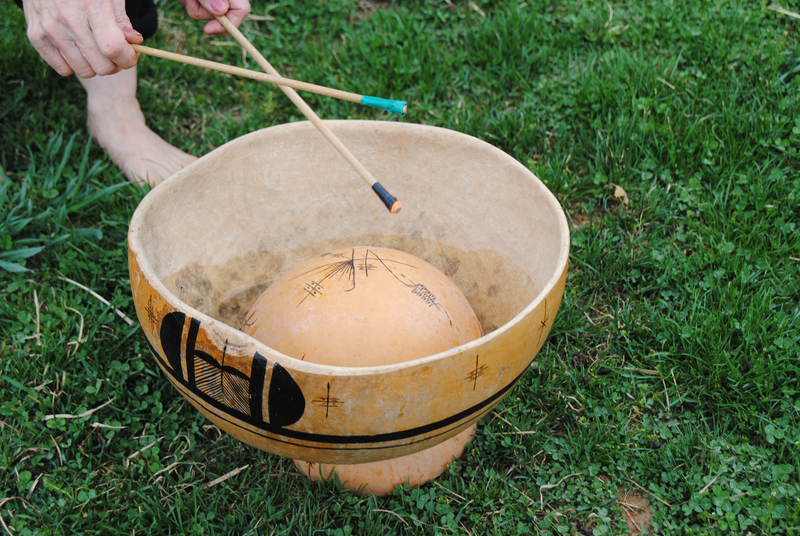 Although there’s no formal written history of early indigenous cultures in the region of Southern California, a variety of resources give us a glimpse into the music and ceremonial life of these various tribes. 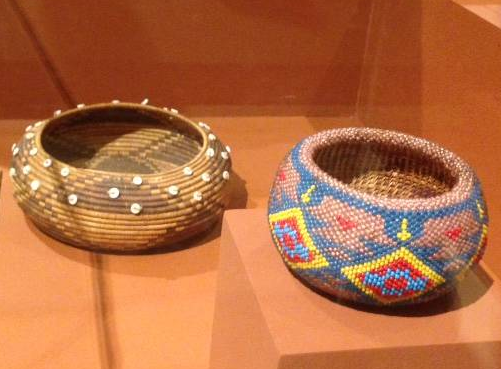 While visiting the Bowers Museum in Santa Ana, California, I was allowed to photograph and share a few of the beautiful music-related artifacts from their vast collection that reflect the early life of Native American tribes in this region. 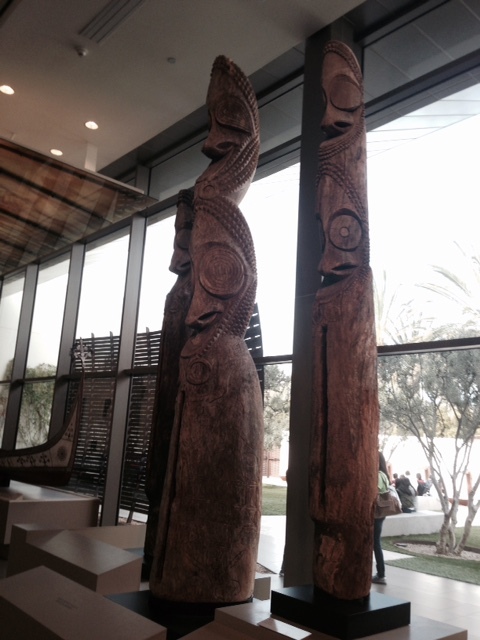 Similar to Chumash culture, which originated north of the museum’s Santa Ana location, the pre-1600 AD tribes of this area also discovered, used and revered “ringing rocks” or bell stones. Pictured here (left) is a huge bell stone identified with Tongva/Agaemen(Gabrieliño/Juaneño) cultures with several man-made areas which were probably used for striking particular notes or for grinding medicinal plants. 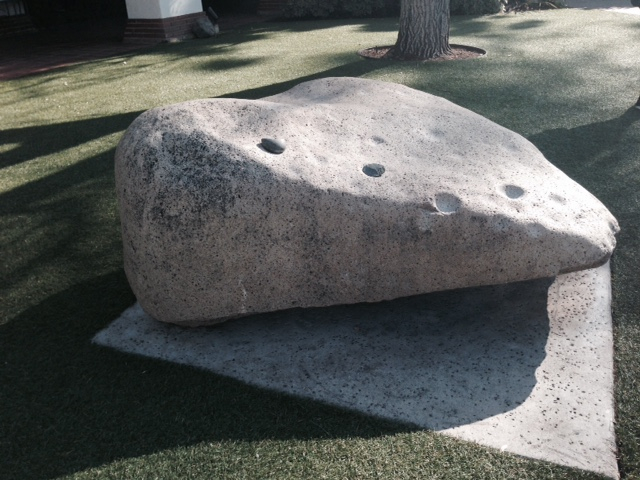 Most often, these large boulders were positioned on top of other rocks to give them more resonance and were “played” by tapping with smaller stones in different areas. Each area that is struck produces a slightly different tone. 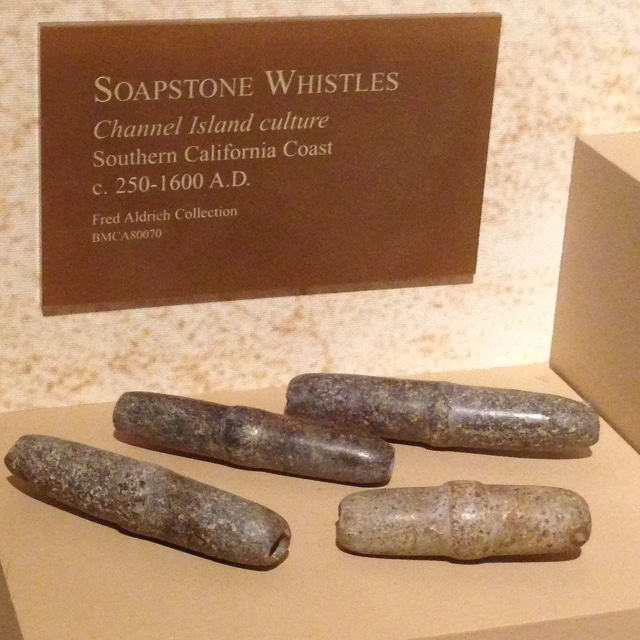 Also attributed to the early “Channel Island” peoples were an abundance of soapstone whistles and flutes of various shapes and sizes. 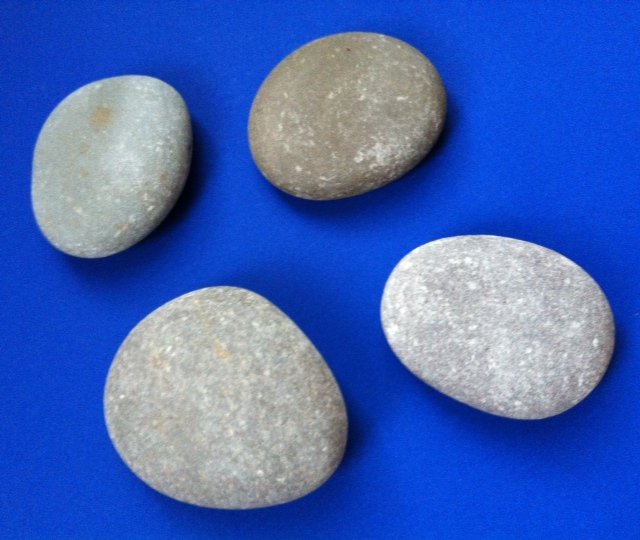 Found throughout this area, soapstone (also known as steatite or soaprock) is a softer rock related to shist that has been used as a medium for carving in many cultures for thousands of years. 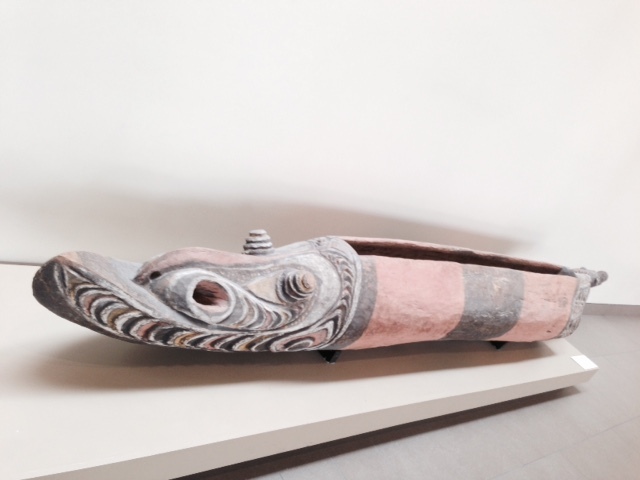 Displayed among the musical instruments is also this large and beautiful soapstone pipe (below) that was excavated from a location in Malibu. 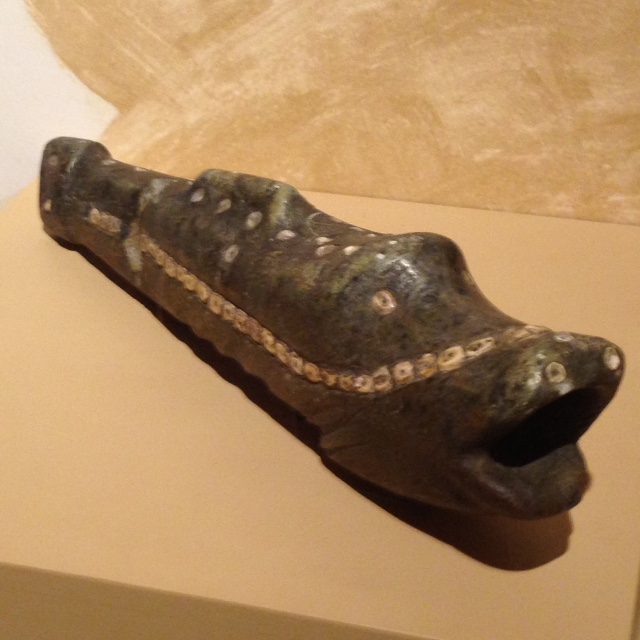 Shaped like a fish, it could have been used as a sacred pipe or as a musical instrument. 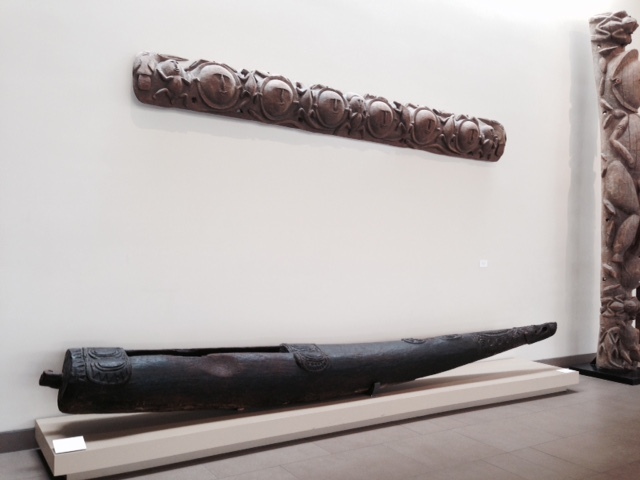 It’s design and decoration share many similarities with the more northern Chumash people’s ceremonial items. 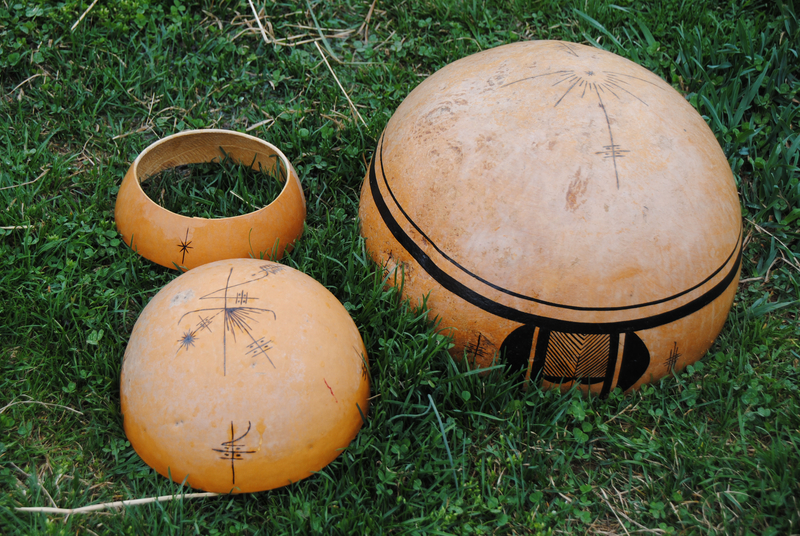 Gifted artisans and basket-weavers, it may be hard to know exactly what the music and dance from this time and place were. 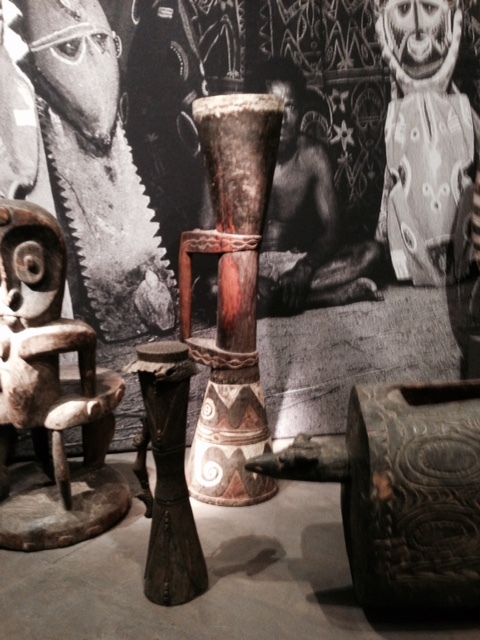 However, these important and beautiful items can help us piece together many valuable details of these meaningful and important cultures. 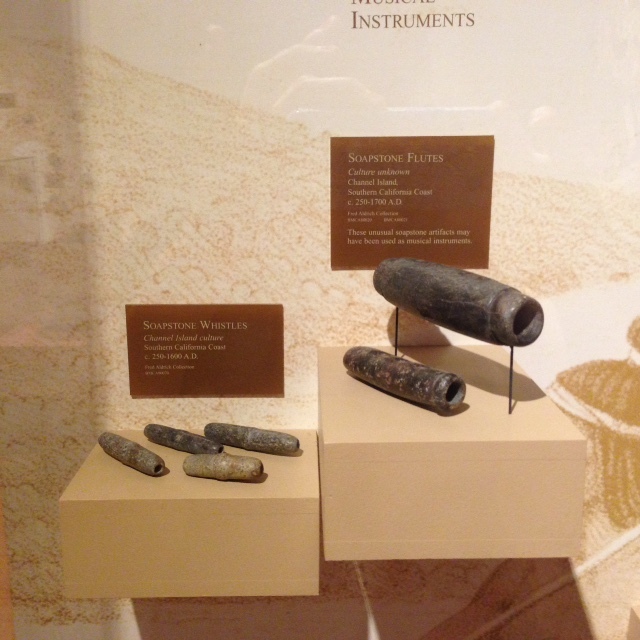 To learn more about Chumash music or to see how stones and rocks are used as musical instruments, check out the related posts below. The sound of the tiny but mighty ukulele plays a big role in the folk music and dance of Hawaii. But, did you know that it was originally modeled after a Portuguese instrument called the machete, brought to the islands in the 1800’s? From there is evolved into the ukelele we recognize now, with a guitar-shaped body and 4 nylon or gut strings. How did the ukulele (or oo-koo-le-le) get it’s name? 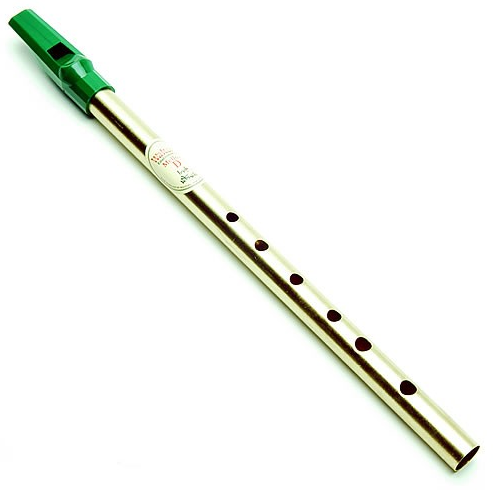 Some people translate the name from the Hawaiian to mean “jumping flea” and say that it describes the “fidgety” movements of the musician’s hands when the instrument is being played. Others translate it a bit differently. One of the last Hawaiian queens, Queen Lili’uoklani, said the name stood for “the gift that came here” by combining the Hawaiian words: uku (gift or reward) and lele (to come). 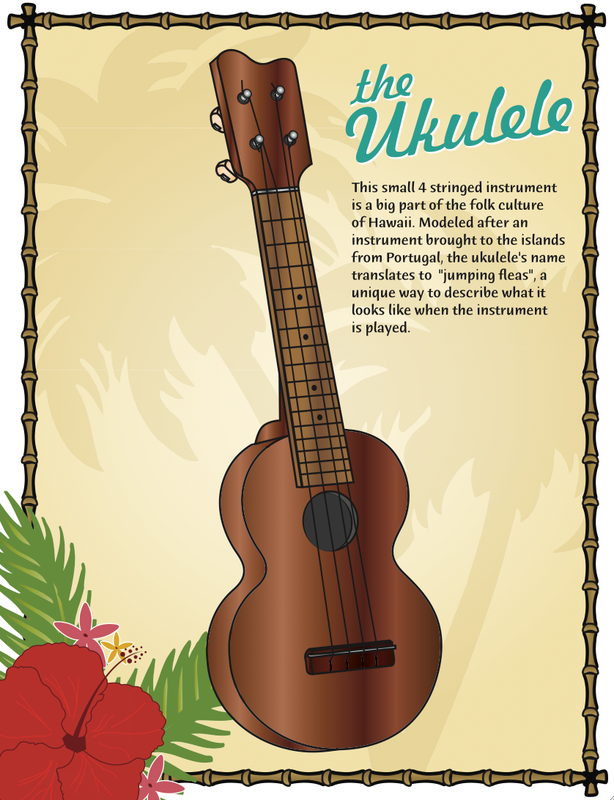 Like many stringed instruments, there are several different types of ukuleles that vary in size and tone. Most commonly, you can find these four different types: soprano, concert, tenor, and baritone. 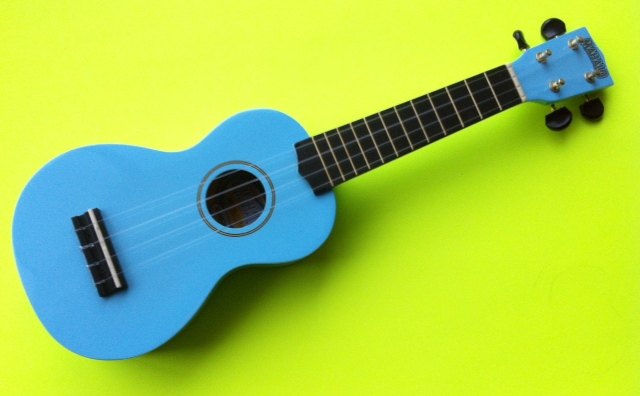 The instrument pictured here is a smaller-sized soprano ukulele. Here’s a short video that shows two ukulele players talking about how they began playing their instruments and performing a duet of a traditional Hawaiian song called “Noho Paipai” as part of a Hawaiian music festival. Another folk instrument of Russia, here’s a short post about a beautiful and well-loved instrument that might be heard at the Winter Olympics this year in Sochi. A balalaika is a three-stringed instrument from Russia that is known and loved all over the world. Although it hails from Russia, you can hear it in many of the regions that made up the former Soviet Union (USSR) and it has also become popular in different countries around the world. If you listen to pop music, you will hear the balalaika mentioned in the Beatles song “Back in the USSR” as well as the Scorpions “Winds of Change”. You can hear Ian Anderson play balalaika on the Jethro Tull album Stand Up and Oleg Bernov plays a huge red electric contrabass balalaika with the popular Russian-American rock band, the Red Elvises. So what is a balalaika? 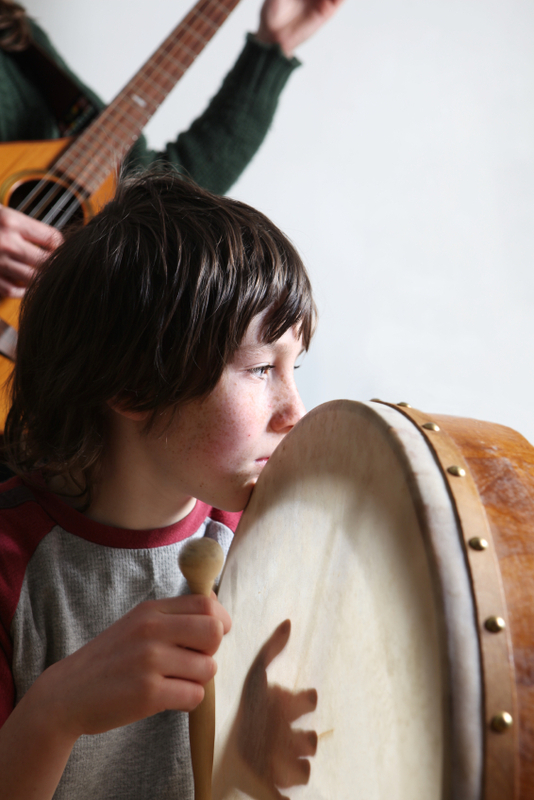 Well, it actually is a family of stringed instruments that are triangular in shape. They range from the smaller, mandolin-sized prima balalaika to the huge contrabass balalaika which is so large that it needs wooden legs to support it as it stands on the floor. 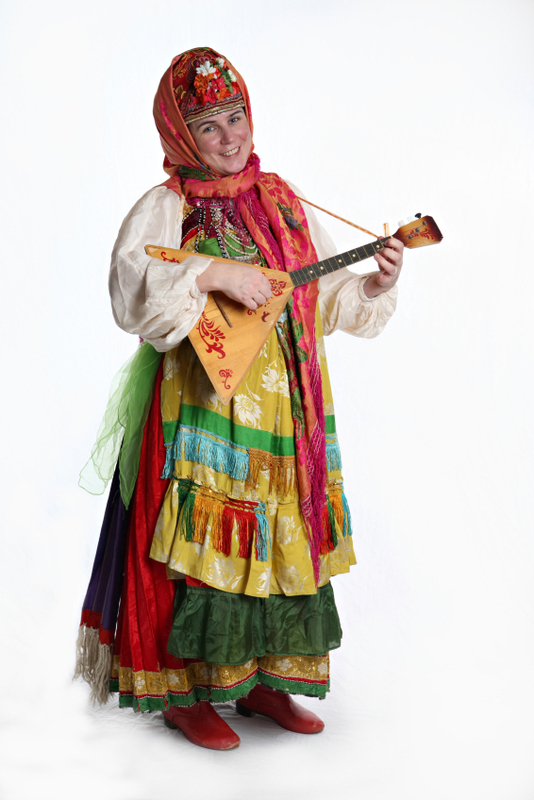 Most often the prima balalaika is heard as the solo instrument and is generally strummed or played with the fingers. 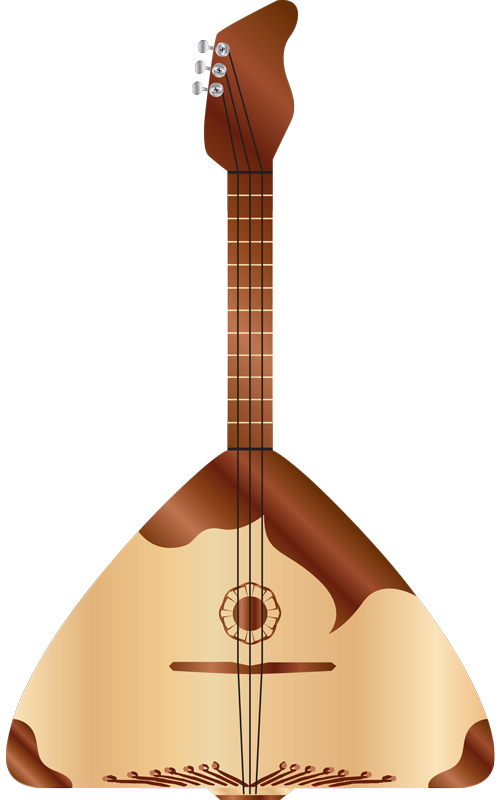 The larger balalaikas (listed below in order of size and tone) are generally played with a pick. The largest contrabass balalaika needs a pick so large it may be made from a large piece of leather or even a boot heel – wow! Would you like to hear a balalaika played with an orchestra? Check out this version of the popular Russian song – the Volga Boatmen. 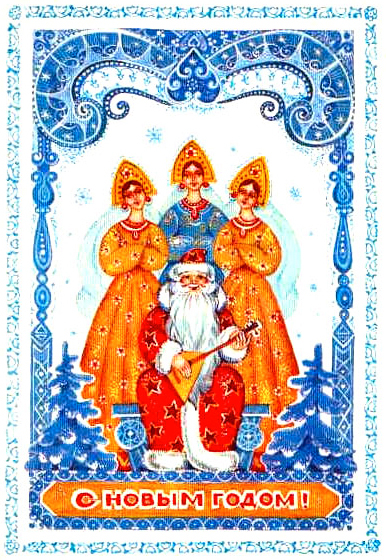 You will see the large contrabass balalaika right in the center of the orchestra behind the vocalist. Want To See A Balalaika Dance? I’ve just finished recording and creating a video animation for the song Tum Balalaika. It’s a Yiddish folksong and the title of the song talks about strumming the balalaika. You can see and hear the song here. Want To See a Balalaika Orchestra? In this group, you can see kids and adults in a balalaika orchestra performing a beautiful version of the Beatles song “Yesterday”. You can also find a great balalaika coloring page below as well as links to other fun balalaika-related info! 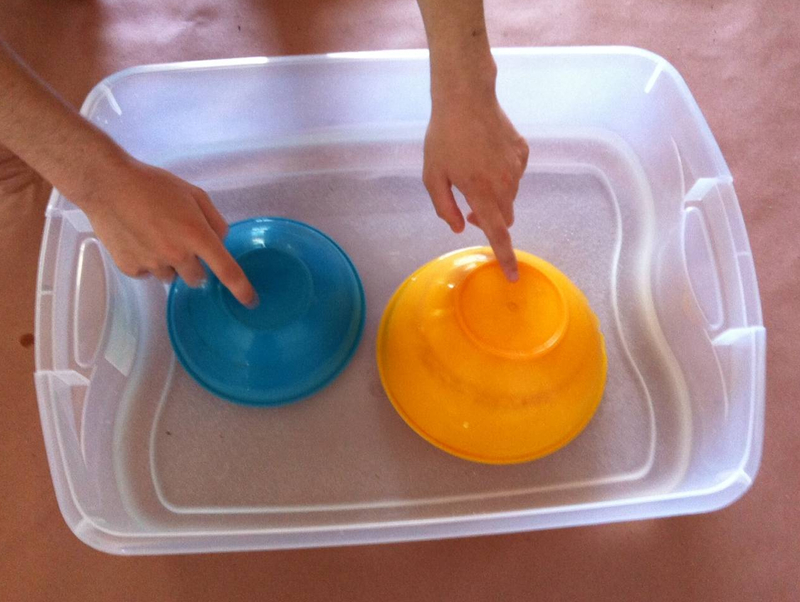 What a great way to share beautiful music and learn about the exciting cultures of the world!